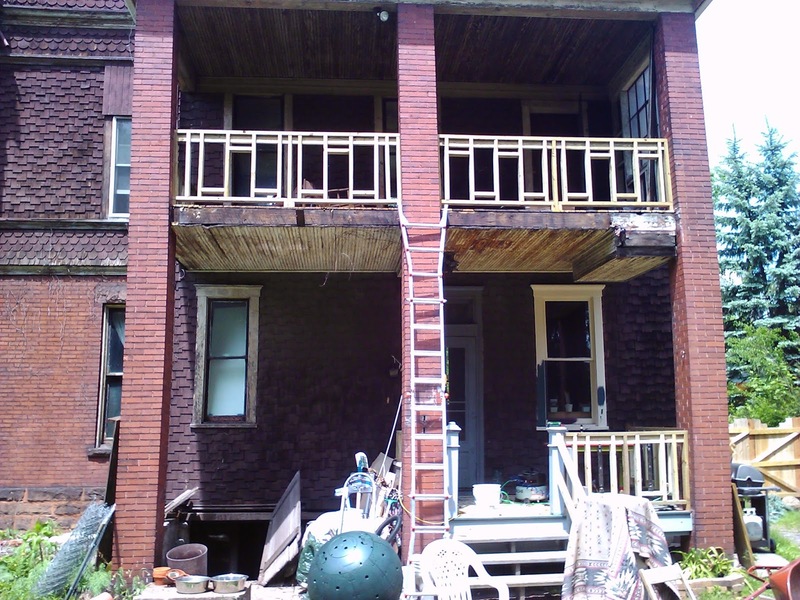 Luckily, the three brick columns added in during the 1920's conversion to multi-family were stable and well-built, and the brick used was even a good match to the original brick of the house. The first thing we did was tear off the bizarre attempt at a stud wall and remains of the fence picket railing on the second floor (first that is after taking care of the bee problem)... After that we patched the rotted original floorboards on the second floor, and rebuilt the first floor porch from scratch, reusing as much of the original wood as was possible and moving the stairs from the side to the front, giving us a nice sitting area. Although the ends of the fir tongue and groove boards were rotten, we figured out that they were all reusable if we cut off the rot, and made up for the shorter lengths by laying a border around the perimeter - doing this just required extra framing underneath to attach it to. This wood is far better than anything you could buy today, it was a shame we ended up painting it. After building a railing to satisfy the bank's requirements, we let it sit. And sit and sit and sit. 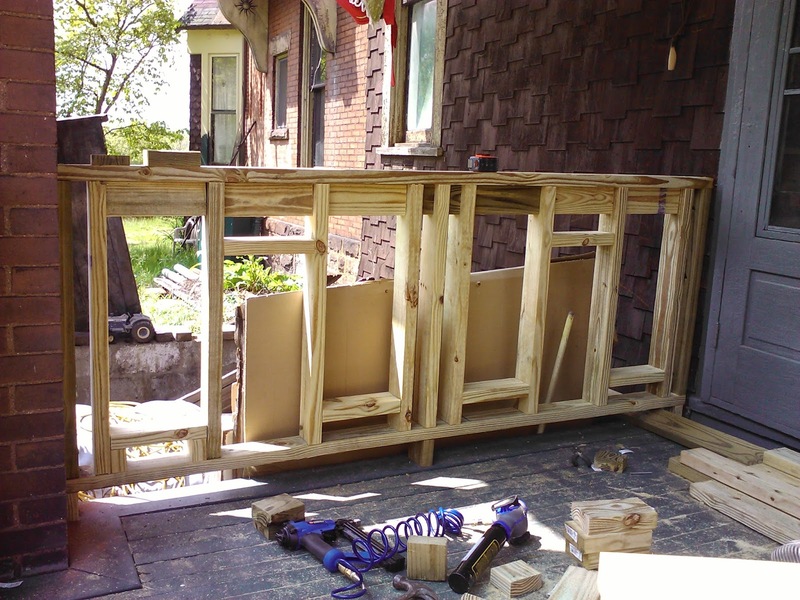 At the time we did the work there was no money to buy nice materials, so we had to make due with 2x4's and salvaged spindles. Coming up with a design that looked decent and met building code was more than a little bit aggravating. That's a very nice original-type screen door. 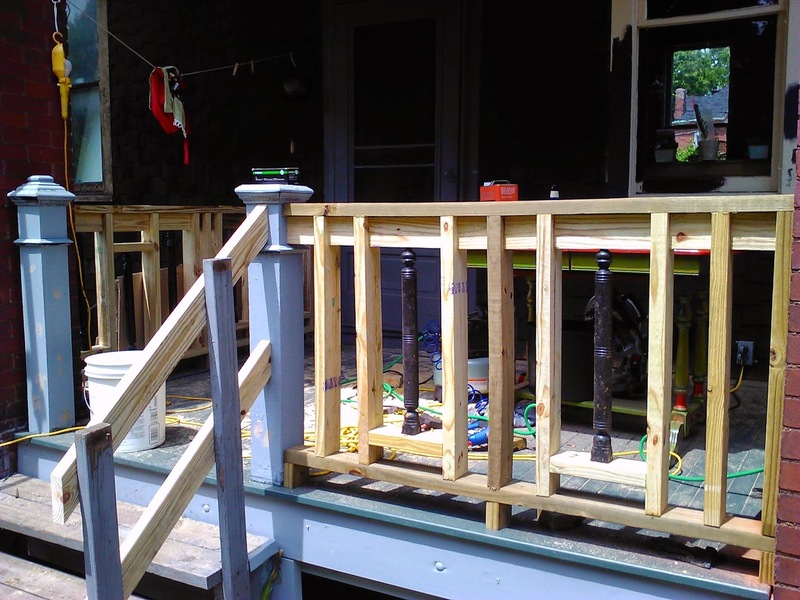 Are you going to put some red accents in it to tie it in with the revamped railing? We think the door dates to the 20's. It was very nice shellacked fir when it started life, but it was always a foot and a half too short for the opening, and has been broken so many times it has VERY little life left in it. I like the way the colors tie in with the brick! I never know what colors to put with our brick. And maybe you could just think of it as doing your part to provide a refuge for the endangered honey bees?